Geelky GE-S001 Product Overview Lamp head and body is made of premium aluminum casing with plastic bottom closing for better heat dissipation and a longer life. Modern design that will naturally fit your desk, office, room, or any table furniture; adjustable lamp head, made from durable aluminum alloy. Choose Your Mood (2700-6500K) Touch sensitive control with 4 color modes (temperature) to choose from Reading, Studying, Computer and Children mode. A 45 min Timer is also available. Choose Your Brightness (5-Levels 100-500 lumens) No matter your need of light. The GE-S001 can accommodate you to your preference brightness level with just a simple touch. Not Just A Light It's handy to have a port near you while completing those difficult task in unexpected places. You can now Plug in your eReader, tablet or smartphone into the built-in 5V/2A USB port. Eye Caring Design to be soft, stable and non-flickering, the lighting is friendly on your eyes so you can enjoy what you’re doing for longer. Touch Controls Slide your fingers along the Sensible touch pad to set the brightness level and the lighting mode of your choice. It’s convenient and easier than flicking a light switch. ✔️ MULTI BRIGHTNESS & MODE LIGHTING: Lots Of Lighting Options, For Different Lighting Needs. Offers 4 Different Lighting Modes & 4 Levels Of Brightness. Proximity Touch Sensitive Dimmer. 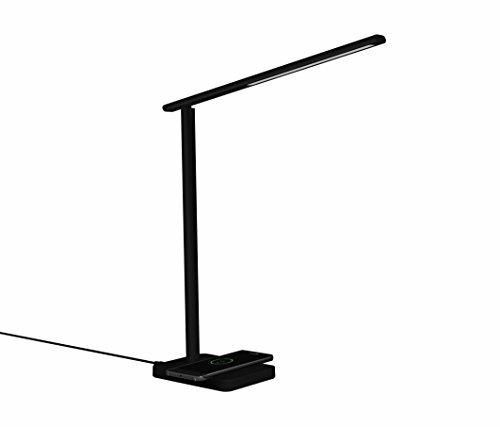 ✔️ SMART PHONE QI-ENABLED WIRELESS CHARGING & USB CHARGING: Say Good Bye to Cables with Ability to Wirelessly Charge your Qi-Enabled Compatible device on the lamp base. A USB Charging port is also available for a second device Charging. ✔️ LONGEST LIFE LED: Our Lamp Uses A LED Bulb That Will Last For 30 Years Under Normal Use. UL Certified Power Adapter. Economical, Reliable, & Energy Efficient. Power Consumption At 16W. Energy Star Certified. ✔️ EASY ON THE EYES: Provides Simulated Natural Light, Does Not Flicker, Low Stress On Eyes After Extended Use. Great For Working, Reading Or Studying. Home Or Office. ✔️ SLEEK & MODERN DESIGN: 15" High Modern Simple Design, Yet Great Looking. Can Be Used Anywhere Space Is An issue, But Quality Light Is Needed. Ability To Fold And Put Away For Easy Storage. If you have any questions about this product by Geelky, contact us by completing and submitting the form below. If you are looking for a specif part number, please include it with your message.